According to the long colophon by the artist himself, this work is a stylistic exercise composed in the company of friends. It follows the great calligraphic tradition of the Northern Song (960-1127) which Shen Zhou had adopted as a virtually exclusive model. He particularly admired Huang Tingjian (1045-1105)- poet, calligrapher, art critic and friend of the poet Su Dongpo (1031-1101) author of the “Excursion to the Red Cliff”. Su Dongpo had turned to sources of archeological inspiration discovered during the Song period that he regarded as marvels of simplicity, expression and profound energy. He responded to the classical models by intensifying creative, powerful brushwork, and introducing the figure of Huang Tingjian himself as part of the tradition. This predilection for archaism emerged towards the end of the Song period, at a time when China’s ancient past was perceived as an encouraging example for modernity. In this work, Shen Zhou’s monumental cursive script -perfectly legible, aristocratic, and full of vitality at the same time- is still close to standard writing. It is enlivened by “heartfelt” Xinyin, that hallmark of personal expression which the great Song, and later Ming, masters particularly sought to achieve. 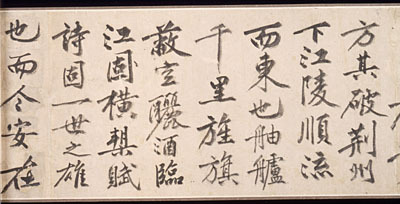 Shen Zhou -poet, calligrapher and painter- is regarded as the influential master of the Wu school, source of major scholar-painters under the Ming dynasty. He was an accomplished scholar who rejected the constraints of a mandarin career to live the life of an esthete. He belonged to the latter half of the 15th century, drawn to the traditional values of the Northern Song and earlier periods. http://www.guimet.fr/wp-content/uploads/2012/01/images_musee-guimet_collections_chine_premiere-ode.jpg 204 400 Super User http://guimet.blacko/wp-content/uploads/2017/07/logo-1.png Super User2012-01-03 14:37:532012-01-03 14:37:53"First Ode to the Red Cliff"